Franzen Maschinenbau GmbH: Franzen 33"
With the new Franzen 33" Franzen Maschinen solved another long lasting problem - sharpening lawn mower blades properly. 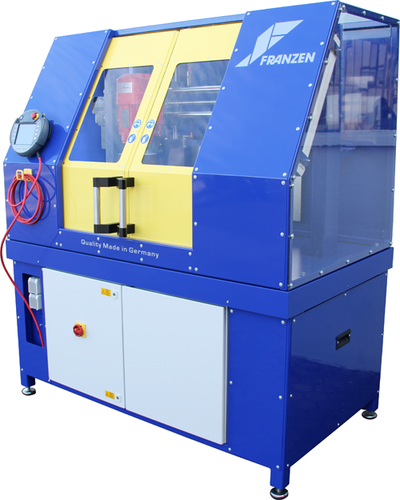 The Franzen 33" is an automatic blade sharpener, capable of regular straight blades as well as mulching blades. The machine is operated via touchscreen, which is freely movable. The recipes (blade geometry) can be adjusted to the individual blade condition before each sharpening process to ensure maximum efficiency. The user solely clamps the blade into the four-jaw chuck and selects a blade from the touch screen. Afterwards the automatic sharpening process starts and the user can walk away from the machine to do something else. The average set-up time for a trained user amounts to approximately 30 seconds - same time for mulching blades. 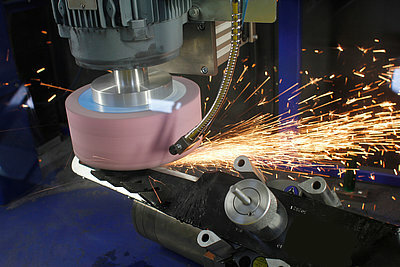 The user is able to programm diefferent blade geometries into the database, should a specific blade type not be present. Typically skilled technicians at Franzen Maschinen pre-programm the database to customer needs and/or update the database whenever needed. Recipe-files can be send to customers via usb-stick or e-mail. This way we ensure the best sharpening experience possible. Buy 10 grinding wheels or more and get 10% discount!